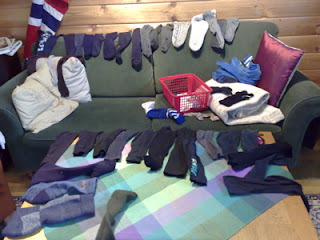 There is this well known problem with socks that have lost their partner. In my family we have a basket for sigles. From time to time we then go throught them. Take a look at my sofa. Theese are the socks tha still lack their better half after pairing. Lagt inn av Bloggerguy kl. 4:56 p.m.